Blackhawk 153001SL Model BHB30 Plain Edge Knife FREE SHIPPING! The Blackhawk Model BHB30 is a versatile tactical tool that you can rely on. It features a rapid assisted opening mechanism that uses a spring to drive the blade into the open position once initiated, as well as a strong steel liner lock that secures it when deployed. Its blade is a classic drop point, with a long slicing edge and a false edge on the reverse for increased penetrating power. The handle comes with injection-molded nylon scales, with a tiger stripe texture that provides a more secure grip. The extended handle ends in a sturdy point that allows it to be used as an impact weapon for self defense, and features a reversible pocket clip for portability. 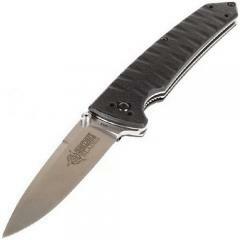 ©2002-2019 CopsPlus.com: Blackhawk 153001SL Model BHB30 Plain Edge Knife FREE SHIPPING!